Untreated wastewater can contain bacteria, viruses, and other pollutants that can impact public health and cause property damage. Sanitary Sewage Overflows and bypass discharges can contaminate waterbodies and cause serious water quality problems. 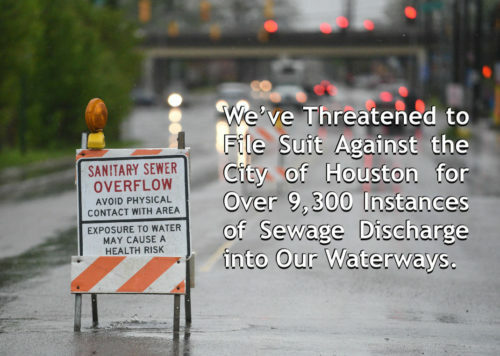 The City of Houston has long been aware of its SSOs and bypass problems and has failed to eliminate them from its wastewater system. Over the last five years, the City has self-reported more than 9,300 discharge violations. These sewage discharges violate the City’s Texas Pollutant Discharge Elimination System (TPDES) permits, indicate improper operation and maintenance of the sewer system, and constitute unlawful discharges into our local waterways. Bayou City Waterkeeper filed this 60-day NOIS because of the City’s history of violations. Since June 2013, the City of Houston has reported sewer overflows and exceeded pollution discharge limits allowed by their permits. The Clean Water Act requires Bayou City Waterkeeper to issue a 60-day NOIS before filing a citizen suit. If an agreement between both parties is not met before the expiration of the 60-day period, the case will move forward. To read the full Notice of Intent to Sue, please click here.